We understand that importance of dedicated technical support. We provide world-class support to all integrators (free of charge). 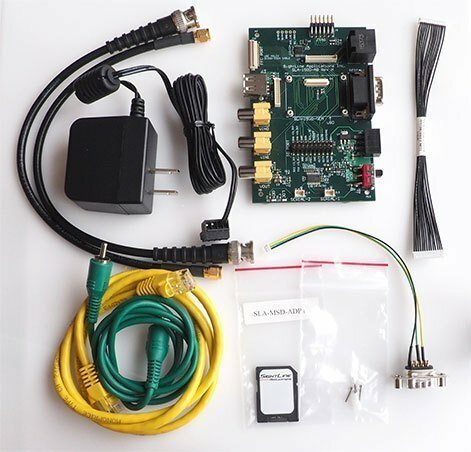 Our bench and camera interface kits provide useful collections of boards, cables, and mounting hardware to simplify the evaluation and integration steps for customers. Includes a bench setup, and necessary cables and hardware to get started. Camera Interface Kits provide easy camera connectivity by including all the necessary hardware and cables. Once a customer is in a production environment we happily sell board-only options and provide manufacturing part numbers for cables, screws, and standoffs to support customer’s production transition. Once the Video Processor has been evaluated, it is common for customers to want to design system specific interface boards to optimize the integration. SightLine is willing to share our interface board schematics to simplify and reduce risk inherent in this product development step. SightLine Applications adds significant value to a wide range of advanced camera systems through our onboard video processing solutions. © 2019 All Rights Reserved, SightLine Applications Inc.